Acrylic recycling is becoming more common with more technological improvements and that’s good news for the environment. Acrylic is a useful, clear plastic that resembles glass but has properties that make it superior to glass in many ways. Common brands of high-grade acrylic include Polycast, Lucite and Plexiglass. Acrylic fibers are synthetic fibers made from a polymer (polyacrylonitrile) with an average molecular weight of ~100,000, about 1900 monomer units. For a fiber to be called “acrylic” in the U.S, the polymer must contain at least 85% acrylonitrile monomer. Typical comonomers are vinyl acetate or methyl acrylate. 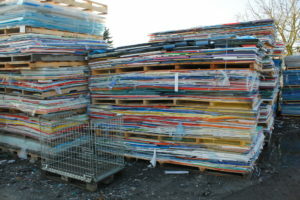 Acrylic plastic is not recycled easily. Like Nylon, it’s considered a Group 7 plastic and mostly not collected for recycling. It is possible to form large pieces into useful objects in case they have not suffered crazing, stress or cracking. Indeed, Items like Acrylic furniture parts are 100% recyclable and have a very long lifespan. AcrylicRecycled acrylic sheets have specific uses in construction for windows and doors along with lighting components like fluorescent lamps and chandeliers. The medical field also uses acrylic for making baby incubators and certain surgical devices. This diverse material also helps in the construct of vehicles and trains. And the advertising sector makes use of acrylic for its signs and light boxes. The reuse of acrylic scrap in the acrylic sheet manufacturing process results in a decrease in the environmental impacts and processing costs. Acrylic Fiber scrap, on the other hand, is generally exported overseas where it is separated manually and blended with other fibers. Though not all acrylic is easy to recycle, continued technological innovation is making the process of acrylic recycling much easier. To see if your acrylic scrap can be recycled or if you have any material that you believe can be appropriate for the recycling process, contact Recycler Finder for a solution near you.